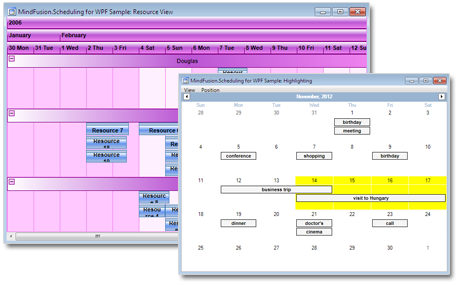 A powerful scheduling tool for your WPF application. In today's fast changing world time is precious and more and more applications need to keep track of it. MindFusion offers you a great way to add fantastic schedules, timetables and resource views to your software with minimal programming efforts from your side. 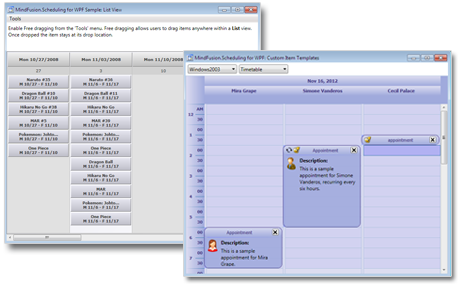 The calendar supports six views, which are very easy to change with a mouse click. Your schedule can show a day with its hours, a week with its days, a month with its weeks and more. There is a Timetable view that lets you show the allocation of resources throughout the day - you can group them by location, task or contact. The List view has two orientations - it can display a single day either on each row or each column. Users can modify and create items interactively, in-place item editing is also supported. The control boasts two auxiliary forms - for creating and editing of appointments and recurrent events. There is also single and multiple item selection. Scrolling and automatic scrolling while dragging with the mouse are supported in all views as well clipboard operations. Each calendar can be customized completely through its style. The appearance of the items is changed with item templates. There are special effects for the header, the item and the text. You have a rich choice of pen and brush styles. You can change the appearance of the whole calendar in a minute by changing its theme. There are no limits to the number of items you can create - the control offers unlimited scrolling if you need to show many items. You can import and export event information from / to Microsoft Outlook, the component also supports the ICalendar format. Schedules can be printed or persisted into XML documents. MindFusion.Scheduling contains three components that let you integrate the complete set of features for project management into your application. 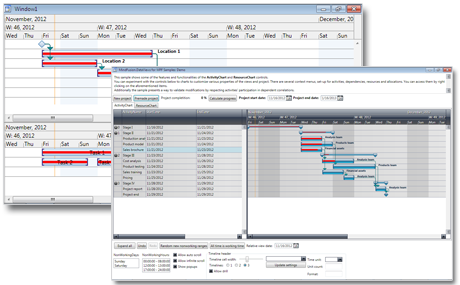 They are Gantt chart, gird and tree view controls. They are used to build an activity chart and a resource chart, which you can use to create a complete project management solution. You can create tasks and dependencies among them, add resources and bind them to the activities. The controls support custom models where you define the dependencies, resources and allocations.